The use of blinds can instantly transform your home to make it more stylish, more private, and even more homely by creating those delightful patterns of light and shade. In practical terms, of course, blinds can also filter sun which might otherwise fade your precious sofas and carpets. With over 20 years of experience, we are able to offer you expert advice which together with our wide product range of blinds means we are able to offer a solution to complement the décor of any home and at prices that will come as a pleasant surprise. We do not pressure sell, we do not have inflated prices which are then discounted heavily, we just give honest and knowledgeable advice about the products and service we offer. Whether you’re looking for light control, heat control, privacy, style, or a combination, it can be a daunting task to choose window treatments that will meet your needs. Light control – decide how much you want to control the light and how much privacy you require. Is the room a lounge or kitchen which you may want to be light and airy and so a sheer fabric would suit or is it a bedroom where you want to be able to sleep and a blackout fabric is required. Privacy – Does the room face onto a street or pubic road which means people can look in? Maybe shutters might be the answer. Is the room south facing meaning the sun streams in and makes the room hot? Maybe a solar control fabric might be the answer. Your budget – Many factors can affect the cost of your blinds. The type of blind, the size of the blind, the fabric or materials that the blinds are made of. Knowing your budget and letting your advisor know the budget, will save wasting your time looking at blinds which because of their type or make up, will be out of your budget. Cleaning your blinds – something many people don’t consider but soon find out that maybe they should have taken this into account. Vertical and roller blinds have fabrics that are washable and most blinds can be kept looking their best with just dusting and vacuuming but it is still a task that needs to be done on a regular basis. Your decor – Is it modern, contemporary, traditional? Venetian blinds quite often fit into modern surroundings whilst roller or roman blinds might be more suited to a contemporary or traditional environment. Your advisor will be able to show you a range of blinds and fabrics which will suit your décor perfectly. For a look at the different blinds available click here. 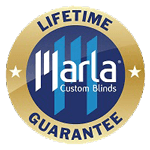 Service and product quality is at the heart of everything we do and after we have fitted your blinds and gone, we want you to be 100% sure you made the right choice by using Marla Custom Blinds. To find out more about our service and the Marla Custom Blinds team please have a look at our brochure and see why hundreds of customers on Checkatrade testify they made the right choice. Product quality is as important as our service and we want to assure you that your blinds will give you years of trouble free service and so all our blinds have a No Quibble 5 Year Guarantee and our conservatory roof blinds have a Lifetime Guarantee if you take advantage of our annual Valet Service.